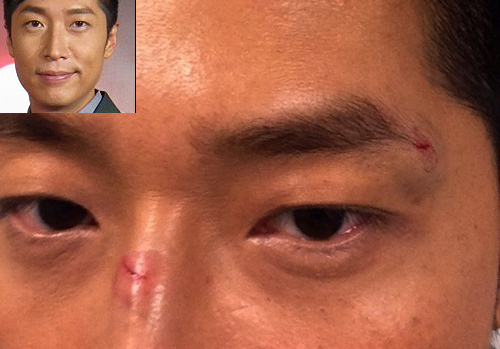 On June 25, Steven Ma (馬浚偉) suffered two nose fractures and a swollen left eye while filming his upcoming drama Property Protector <守業者>. During an action scene, a gun was accidentally flung towards Steven’s face, causing the injuries. The 41-year-old is currently resting at home, though he accepted a telephone interview today to give more details about the accident. Steven then revealed how the accident occurred. “In the scene, my opponent was pointing a gun at me, and I was supposed to kick the gun away with my right leg before my opponent follows it with a punch. I kicked pretty hard, but my opponent’s finger is still hooked onto the gun, so the gun came flying towards me!” Steven does not blame his colleague however, and is thankful that the injuries are minor. It was an accident. It’s got nothing to do with how TVB treat their actors/actresses. At least they actually let him have a 5 day break. If they didn’t and hurried him bck to work straight after the accident THEN i’d be scolding the company for not taking care of artists’. Well his face looks pretty bad though so it wouldn’t look good for filming. I wonder if they’d let him rest as long if he was hurt as badly but in a different area than the face. When accidents like this happens you really get to see the person’s personality. With injuries like that, and having had the possibility of a retina detachment, he was still able to be understanding of the situation which is definitely something that’s not easy to do. Lets hope for a speedy recovery! Agree- it was a 50/50 chance of being blind really o_O !!! Thankfully his eye was a miss, i’d be devastated for him he lost his sight from this accident! I got a similar (straight, and not oblique) scar on my nose when I fell in an accident. It took me a good period of 6 months to heal completely. Hope he gets well soon!! It is only a modern series and he is already injured like this? I wonder if it would have been worse it if were an ancient series??? Well no matter what type of series or set in whatever era, an accident is an accident, depends on everything happening at that particular moment. Take kate’s fall for example, a simple slip from a puddle of water could be more severe than being scarred by a prop. She could’ve been disabled by the fall if it damaged her backbone, or someone could lose their eye sight from being hit by a gun. Thankgoodness the artists’ injured recently weren’t deathly is all i’m glad for. True, but I thought that you would be more prone to injuries in an ancient series due to the action scenes and all. Poor guy. It looks super painful. Wish him a speedy recovery. Get well soon Steven. The mark of a true great man is in the way he handles adversity and Steven’s reaction to this accident and his appreciation of the people around him truly shows that he is a great man. Can’t wait to watch him and Tavia in this show. I always find Steven to be a very classy guy. I hope he gets well soon. Yes, Steven is not only classy but also very pragmatic, and appreciative of other people’s situation. Despite the pain, he is showing this “No problem” (沒事) tough guy attitude. His weibo. The next few days will have to depend on fellow property protectors to hold down the family business. Sam Siu (3rd young master) will rejoin the troop at Pan Homestead in no time to fight off the monsters, haha! Jesting aside, quite a serious injury that could have been even worse. Get well soon, Steven! Many years ago when shooting “A Change of Destiny” my right eye was injured by a horse, and quite seriously, too. And this time while shooting an action scene in “Yuan Yang Pei” (鴛鴦佩), my left eye got hurt. Haha, one left one right, now finally a match. Luckily this time it was not too serious, just a little bit swollen and a small cut that is now scabbed over, most probably will not leave a scar. This is considered lucky already. Actually, having been in this industry for many years now, getting injured while filming action scenes is inevitable. Especially when filming ancient wuxia dramas, the injury rate is even higher. Guns, knives, swords, staffs, face to face combat, or wire suspension etc. ; even if the martial arts supervisor had beforehand implemented all the safety precautionary measures, and had also meticulously and carefully scrutinized the choreography of each and every action and movement, and had the action rehearsed numerous times prior to filming, but accident being accident will still happen; it maybe that the other party made a small mistake or that I myself miscalculate, either one or both parties will inadvertently get hurt at any given time. Anyway, a collaboration with martial arts brothers has this one particular characteristic, which is, the majority of them are straight-shooters, and under the premise of mutual trust, regardless of who accidentally injured who, they will all without hesitation utter “No problem” (沒事); this kind of mindset, I truly appreciate. Accidents while shooting are often reported on news, so actors and actresses, please be extra alert and take care: Good health is always the most important possession in one’s life. An average looking guy but his acting is super extraordinary!!!!!!!!! !